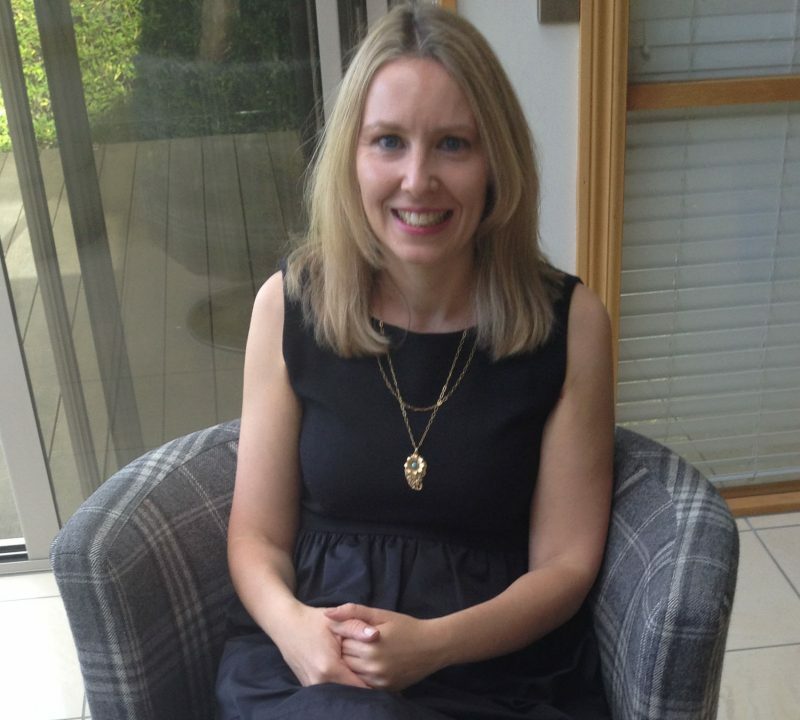 The final member of staff to be profiled is Marketing & Social Media Manager Sonia McEwen who joined Deirdre Dyson last December. No two days are the same but a large part of Sonia’s time is spent managing Deirdre Dyson LLPs social media, including this Blog. 1) Looking back over the past year, what would you say was your most memorable moment working at Deirdre Dyson? 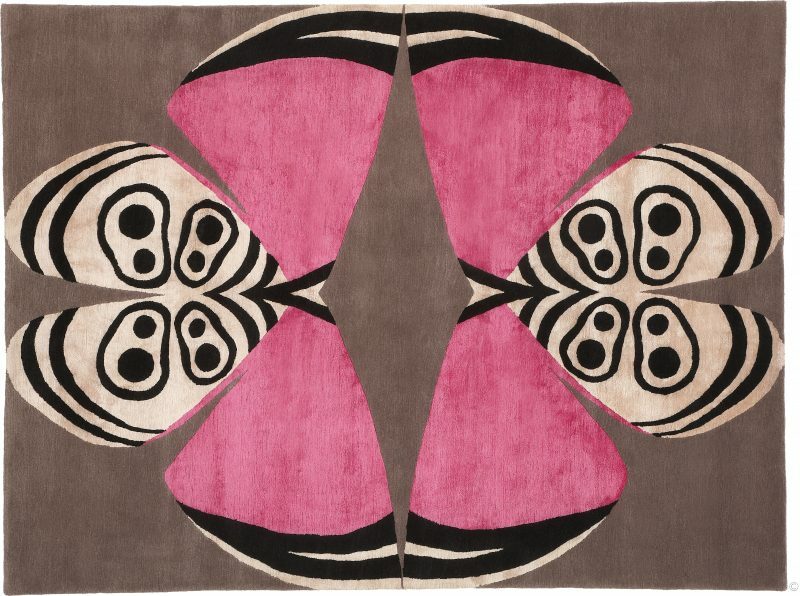 Having seen the design process from start to finish for the first time; the arrival of the 2015 Collection of rugs from Nepal. 2) From the choice of Deirdre Dyson designs, is there a particular favourite that you have and if so, why? DAWN from the 2015 collection – at first glance it appears to be a really simple design but it’s so cleverly graded and the colours used blend so well that it creates an optical illusion. 3) As a member of the CDQ, (Chelsea Design Quarter) is there a particular company or showroom within the vicinity that you like or would recommend to others? VILLAVERDE for their elaborate lighting, it’s always worth a glance in the window. 4) Seeing that Christmas is fast approaching, what would be on your ‘Christmas wish list’ as the ultimate present? I can’t think of anything for myself but if you asked my children it would be Lego, they can’t get enough of the stuff! 5) And what are you looking forward to in the New Year? Moving back to our newly refurbished showroom, it’s been really exciting watching it’s transformation over the past few months! 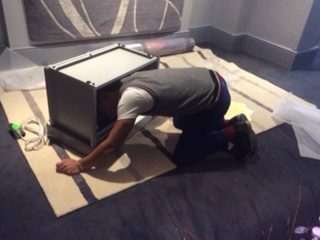 It might look like Edison has his head stuck in a microwave, but actually he’s just been putting together the latest addition to our studio equipment…a light box that helps us and our customers see their selection of colours under different light sources. 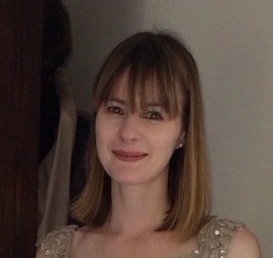 Nichola Webb is the longest serving staff member and has worked with Deirdre since 2002. Nichola is a CAD Designer and converts Deirdre’s hand drawn and coloured designs to digital artwork which is then used as a template by our weavers. I really enjoyed the CDQ summer street party in June. It was a fantastic evening, a nice celebration and introduction to our temporary showroom as we had just moved in. I also enjoyed visiting Designjunction, it was so contemporary and inspirational. A nice balance between creative and commercial. I think all the ‘Butterfly Collection’ is fabulous but my favourite is FARFALLA. 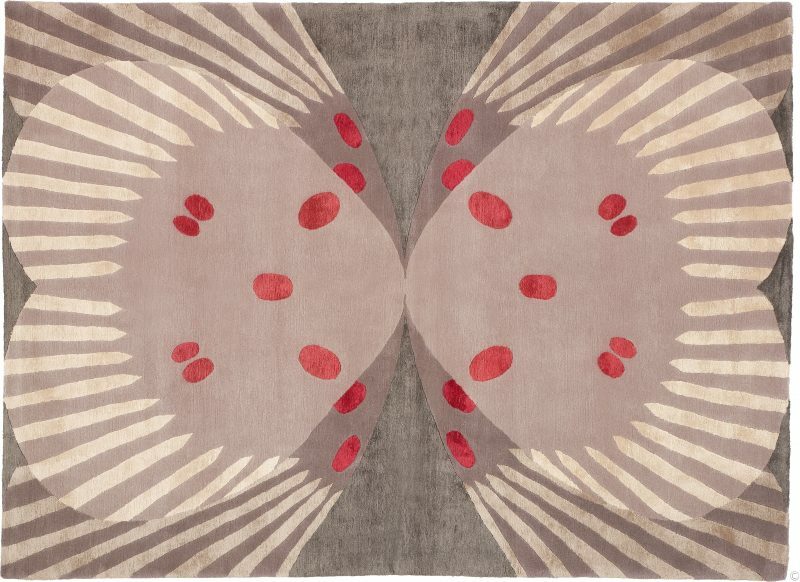 It is such a beautiful design, well balanced with a combination of natural colours and lovely silk red spots. It makes you smile and could be used in various locations. 3) As a member of the CDQ, (Chelsea Design Quarter) is there a particular company or showroom within the vicinity that you like and would recommend to others? 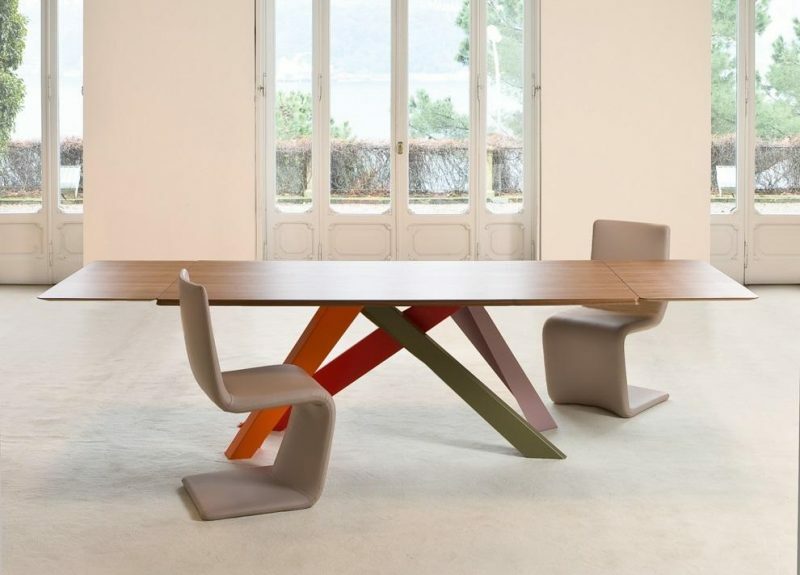 GO MODERN specialises in contemporary design-led furniture. They have really lovely, unique furniture for the whole home. My favourite lunch spot is Jaks, hidden away in a basement on the Kings Road with amazing Mediterranean food, authentic décor and a great relaxing atmosphere. 4) Seeing that Christmas is fast approaching what would be on your ‘Christmas wish list’ as the ultimate present? As I have all my family in New Zealand, spending time with my nephew, niece and family is my ultimate present. Nothing comes close to this. I’m so excited as it is so close now. We are all very excited about moving back to 554 Kings Road, into our newly refurbished showroom next year. The showroom is going to be spectacular and a beautiful space to work in. Definitely a highlight of the year. 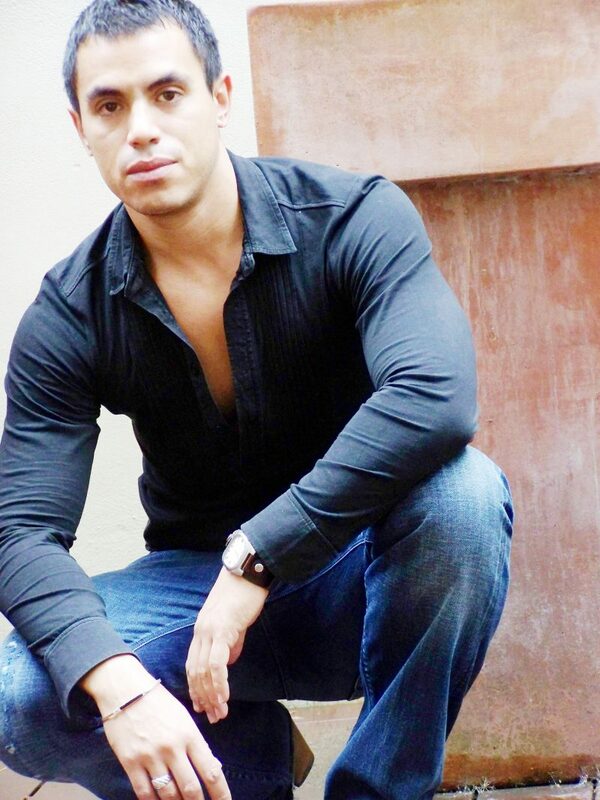 Edison Abidi is a qualified Interior Designer and has been working for Deirdre Dyson since February 2007 as Showroom/Company Manager. Memorable moment or should that be most memorable challenge? Yes, definitely most memorable challenge. That was to project manage our participation at the May Design Series, whilst organising the refurb of our temporary showroom at 602 Kings Road as well as arranging our exit from 554 Kings Road to make way for the exciting refurbishment taking place there…and all this happening at the same time. I’ve quite an eclectic taste and I’m often drawn to bold, statement pieces. The PALOMA design from the ‘Butterfly Collection’ is one of my favourites. I love the colour pink. It’s a happy, ‘feel good’ colour and this works well against the neutral background and black patterning of the wings. Orchid, which is next door to our temporary showroom. As well as very friendly staff, they have a beautiful selection of modern and vintage oriental furniture and accessories. 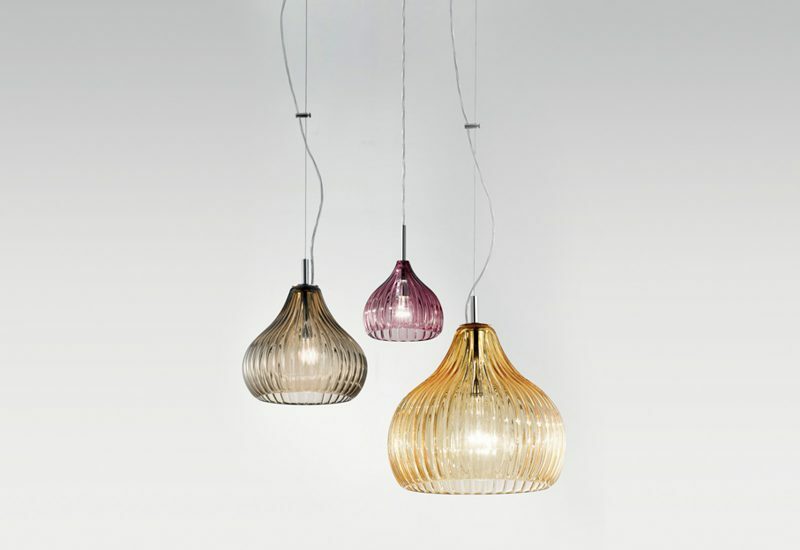 Some great pieces that mix well into most modern interiors. 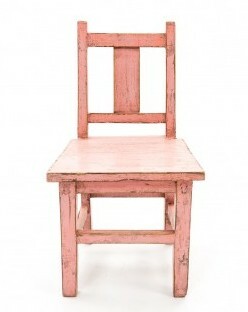 I bought a 20th century pink children’s chair from there, to use as a small, low bedside table. 4) Seeing that Christmas is fast approaching, what would be on your ‘ Christmas wish list’ as the ultimate present? (laughs). Ultimate present? I have much more than just the one. That ‘Christmas Wish List’ is way too long to print on here. I’m not the first to say it, but the move back to our refurbished showroom at 554 Kings Road. 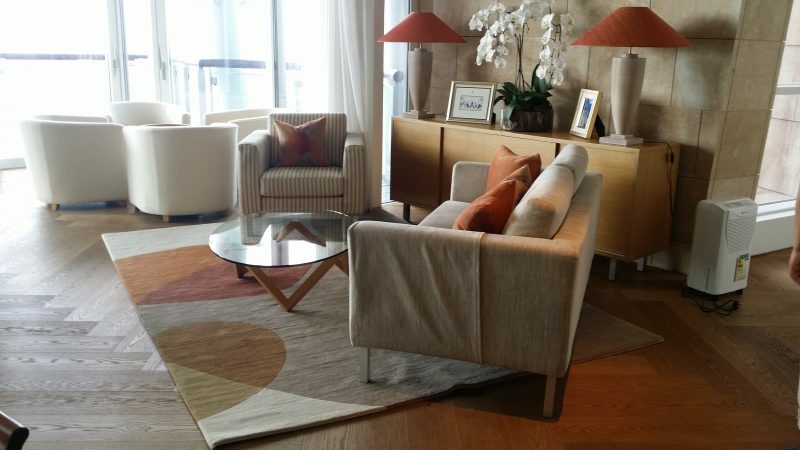 It’s going to be an exciting time for everyone and with a stunningly, modern interior, the showroom will act as the perfect backdrop to the beautiful carpet designs. It will definitely be a talking point for some time to come. 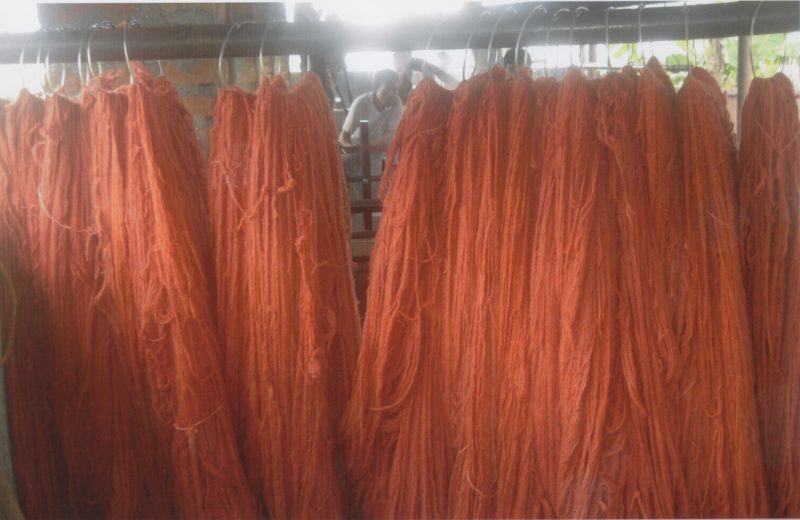 After we’ve helped you choose the right design in the right colours and size to suit your scheme, the finished artwork and exact colour palette is sent to Nepal. 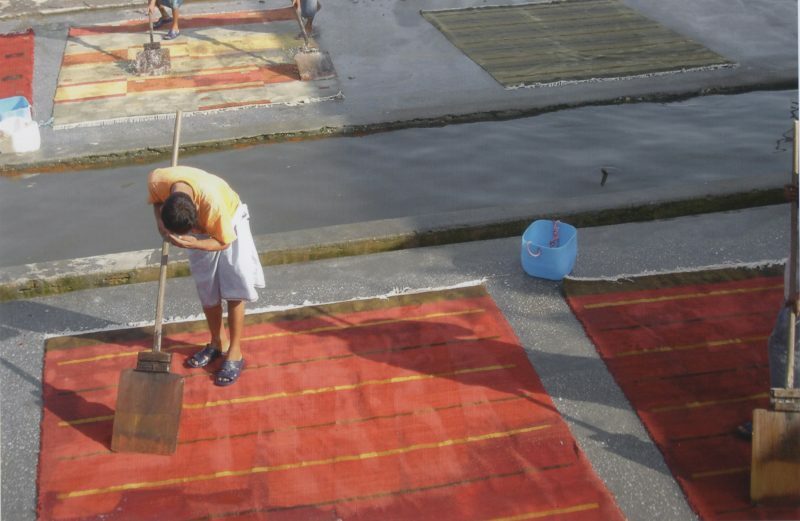 It takes 14-16 weeks to produce a hand knotted carpet, which can seem a long time in our world of instant gratification. 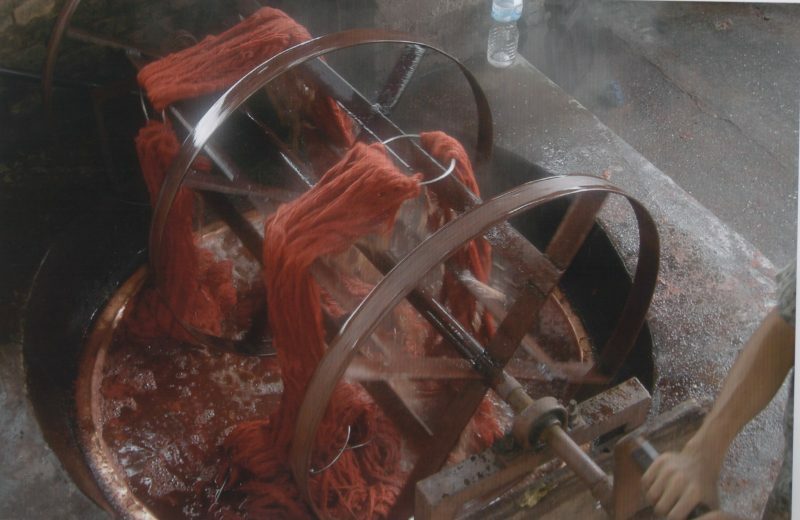 These images show just why your bespoke rug takes such a long time to make and some of the age-old artisan processes used at each stage of its production. Once it’s washed, dried and checked your carpet is shipped directly to our London showroom and the finished product is revealed! 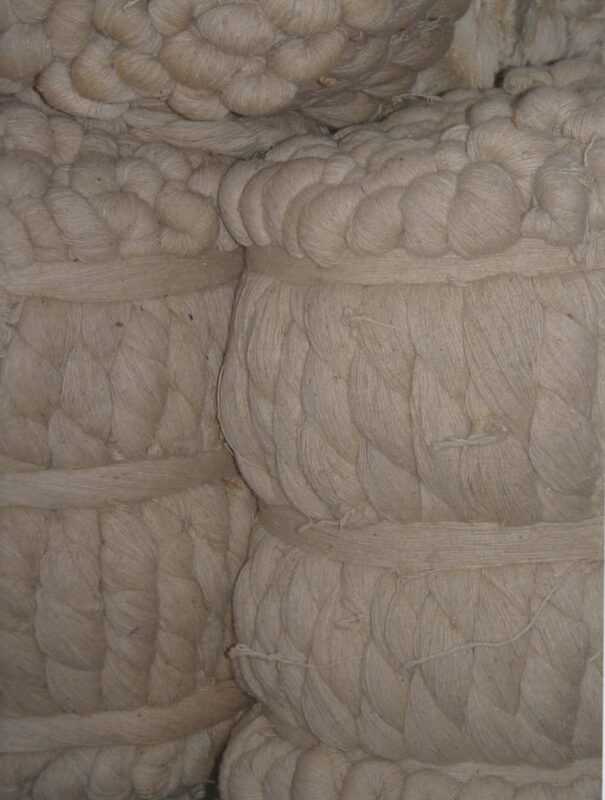 Ethical production is hugely important to Deirdre and all our hand knotted rugs are GoodWeave certified. 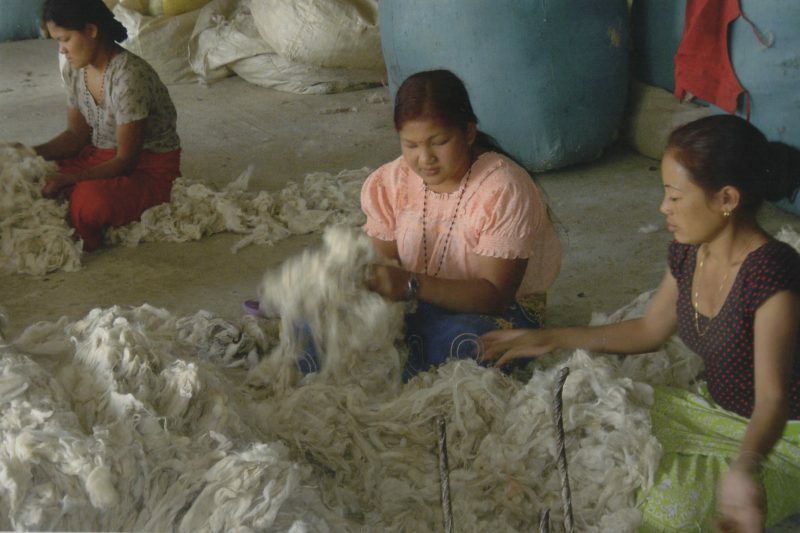 GoodWeave certification is your guarantee that no child labour has been used at any stage of your rug’s manufacture. 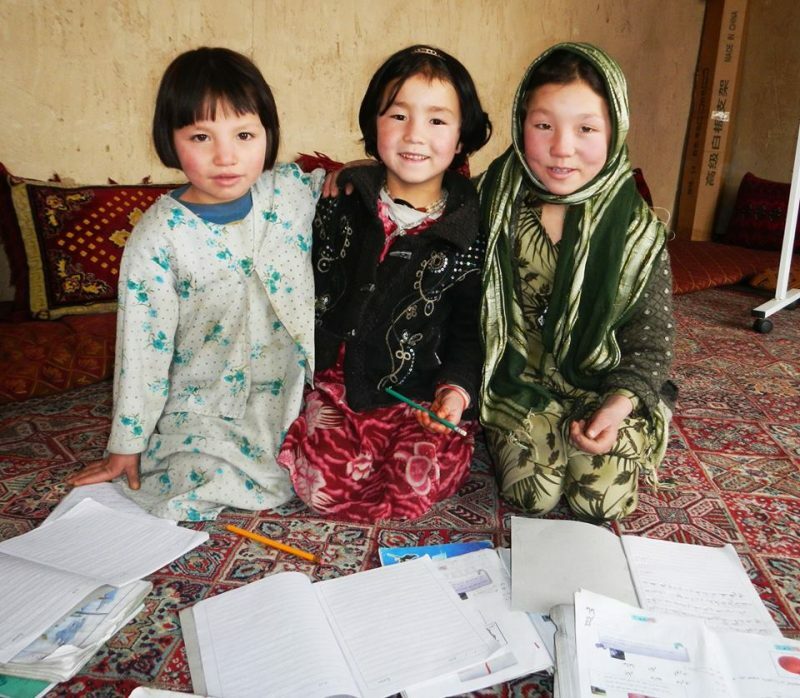 By buying a GoodWeave labelled rug, you are supporting the work GoodWeave does to ensure children discovered manufacturing rugs are returned to their families, given an education and taken out of child labour permanently. 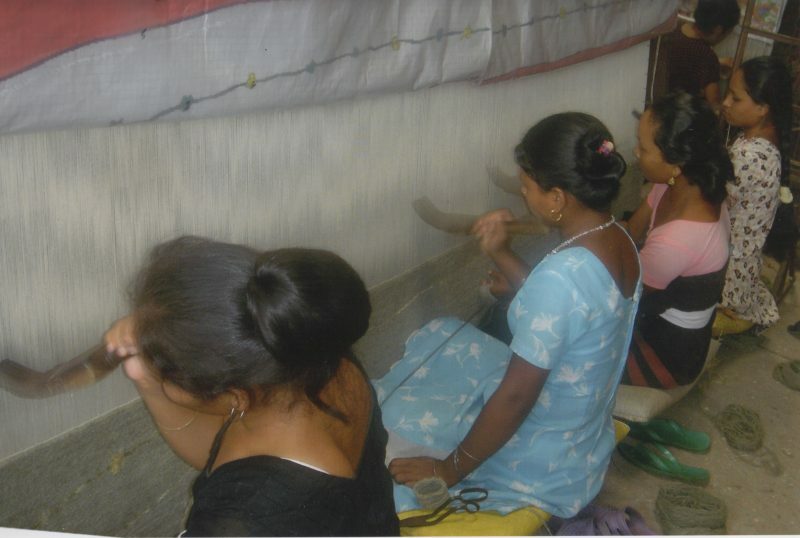 Though GoodWeave’s ultimate goal is to end child labour in South Asia, it also actively supports weavers, improving training and working conditions and provides essential day care and schooling for their children, who would otherwise be left hanging around workshops whilst their parents work. 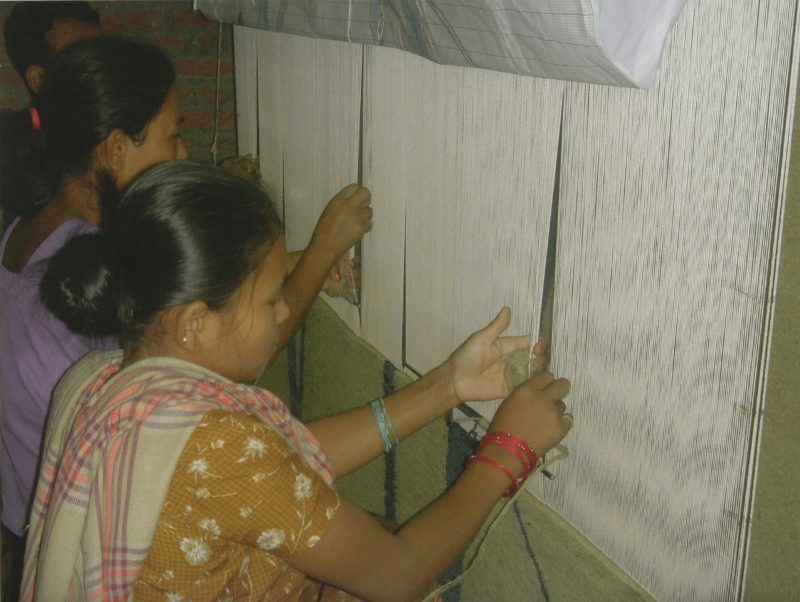 GoodWeave labelled rugs may cost a little more but the work they do is essential in increasing welfare standards for weaving families and expediting the end of child exploitation in the rug industry. 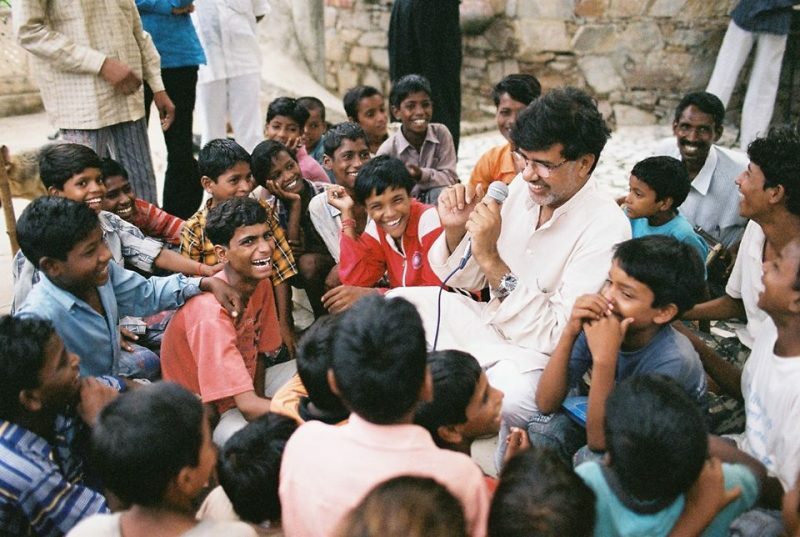 On 10th October 2014 GoodWeave founder, Kailash Satyarthi, deservedly won the Nobel Peace Prize. 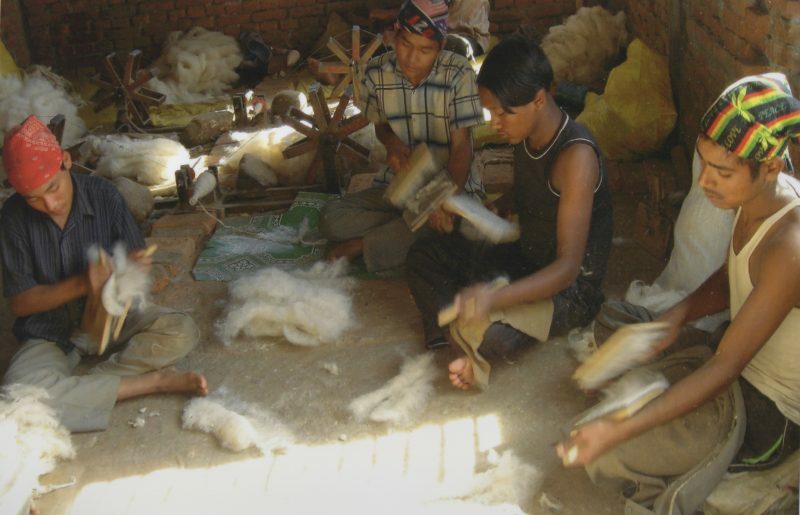 You can read more about Kailash and what inspired him in his mission to end child labour. 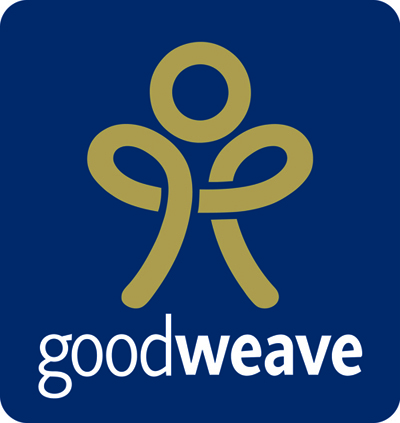 You can donate to GoodWeave here. 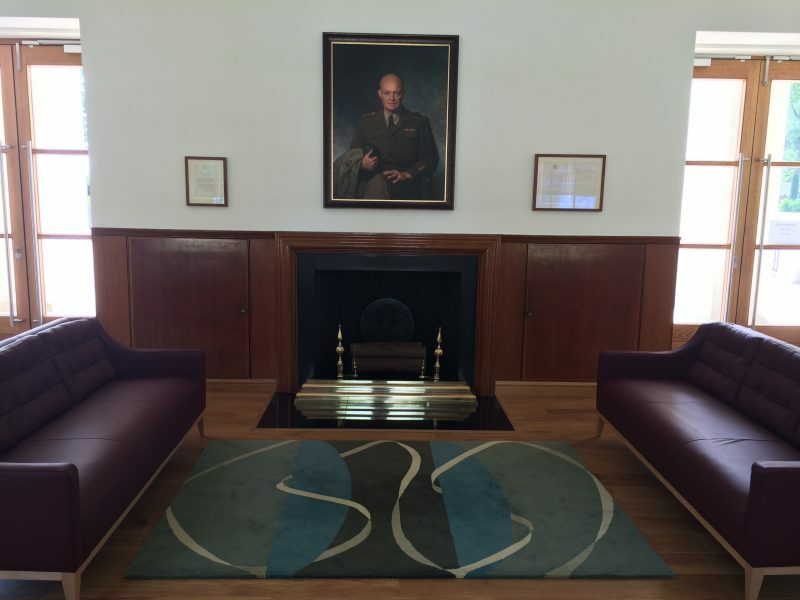 We were delighted when the British Consulate in Hong Kong chose Deirdre’s PLECTRUMS design as part of the interior scheme at the Consul-General’s residence. The Consulate makes a point of showcasing British Designers and goods and we are thrilled to be in the company of well established British brands such as Liberty and Colefax and Fowler. The Consulate’s representative selected Plectrums for the scheme and our Designer Nichola created a pair of oversized versions in a slightly different colour arrangement to Deirdre’s original colour choice. 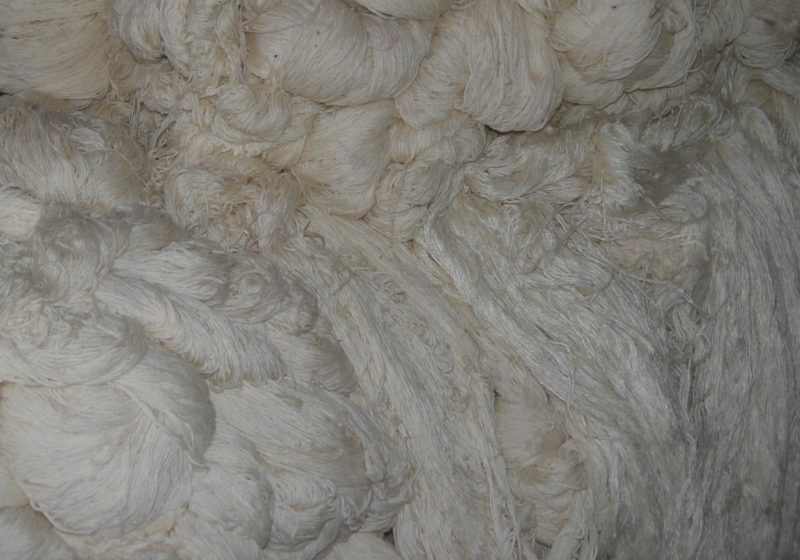 They were then hand knotted in 100% wool in Nepal. 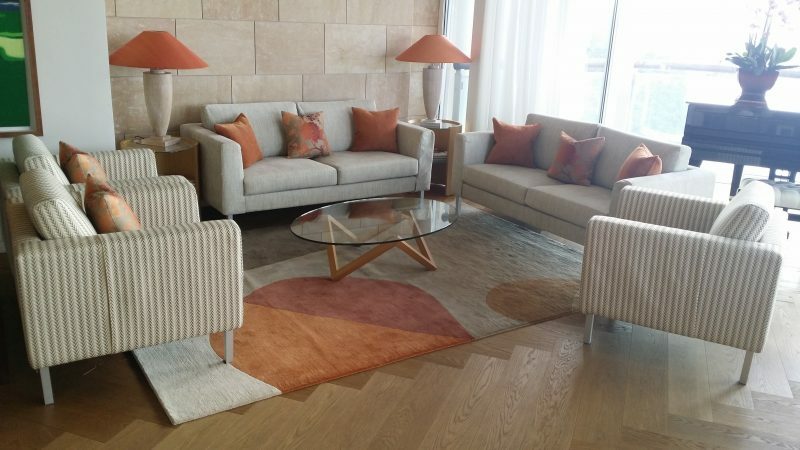 The rugs have been positioned to mirror each other, creating two distinct seating areas and look stunning on the parquet floor, blending brilliantly with the residences existing colour palette. 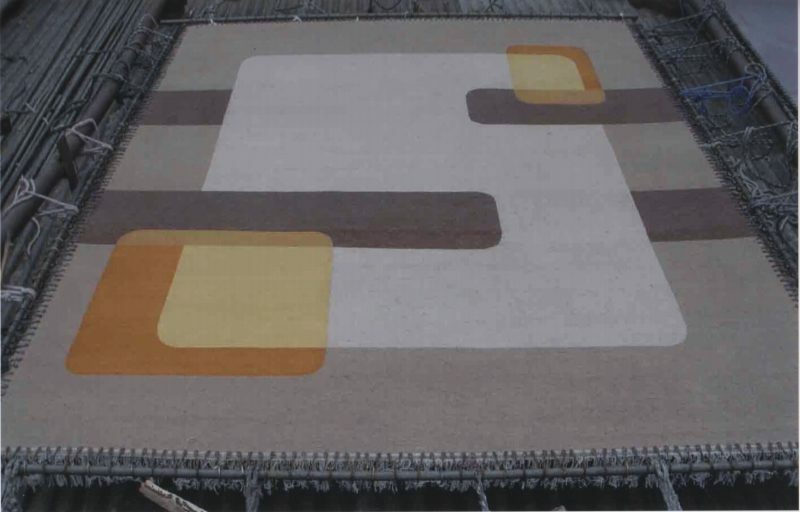 We can alter any of our carpet designs to suit your specific requirements. Runners are particularly popular and a great way to inject interest into a hallway, landing or stairs. 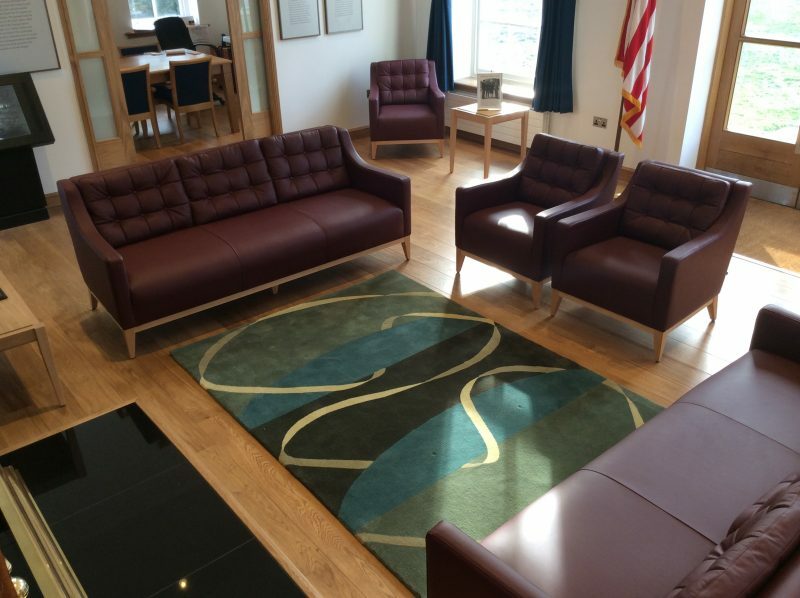 We’ve recently finished some commissions where our Designer Nichola has cleverly altered Deirdre’s carpet designs, creating particularly effective results. 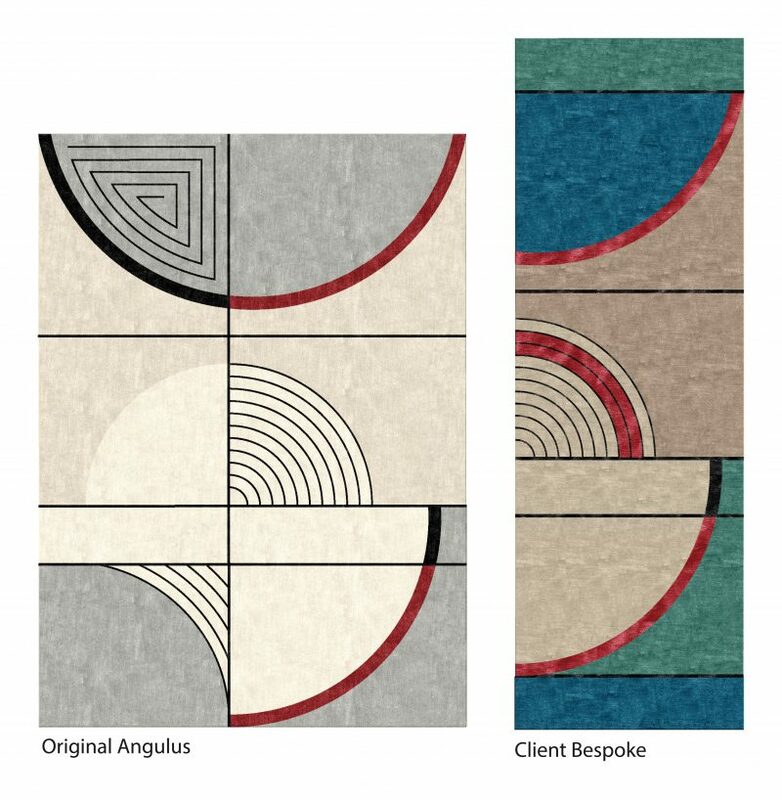 For this project Nichola adapted ANGULUS and used the client’s chosen colour ways to create a really vibrant entrance runner for a solicitors office in London. The client’s colour selection worked particularly well in this long form version. 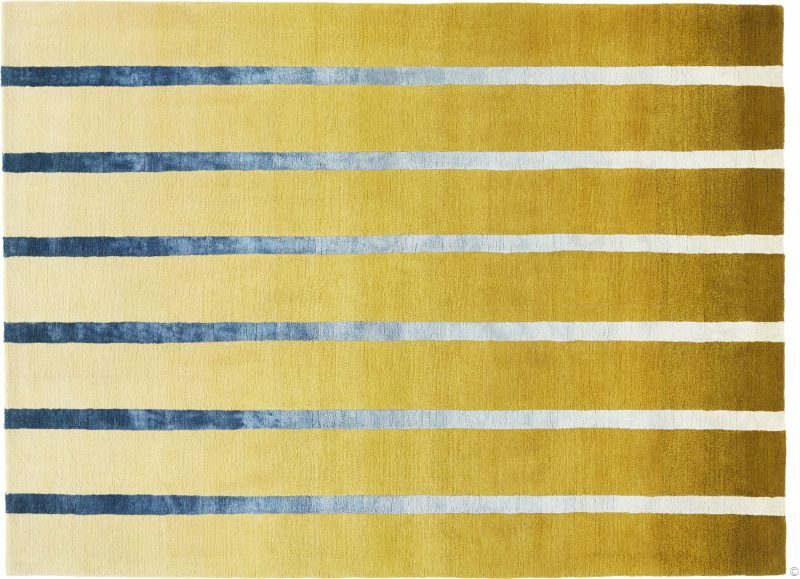 RHYTHMS is one of Deirdre’s classic designs, incorporating her trade mark ribbons. In this case the client chose a slightly lighter colour palette with the elongated copper ribbon trailing through the design. 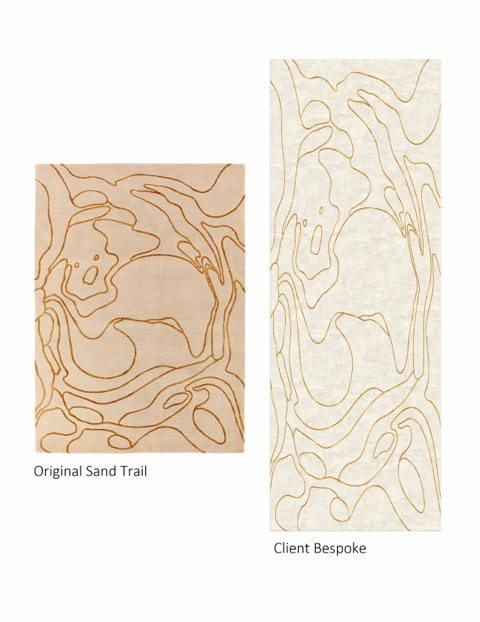 In the example above the Interior Designer wanted to transform SAND TRAIL from the 2014 collection into a runner for a hallway. As the name suggested SAND TRAIL was inspired by the patterns left by the sea on the sandy beaches of the stunning Archipiélago de las Perlas, near Panama, Central America and the extended pattern in the original colour selection looks spectacular. 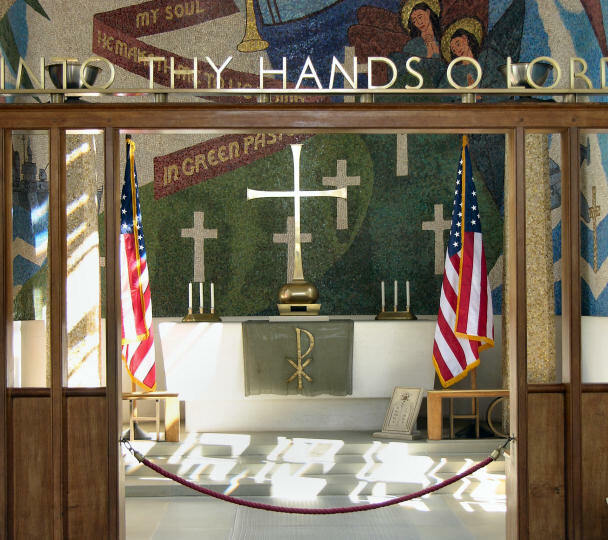 Several months ago Interior Designer Andrew Thorne of Think Thorne commissioned us to create a hand tufted 100% wool version of Deirdre’s RHYTHMS design for the Grade I listed American Cemetery at Madingley in Cambridgeshire. 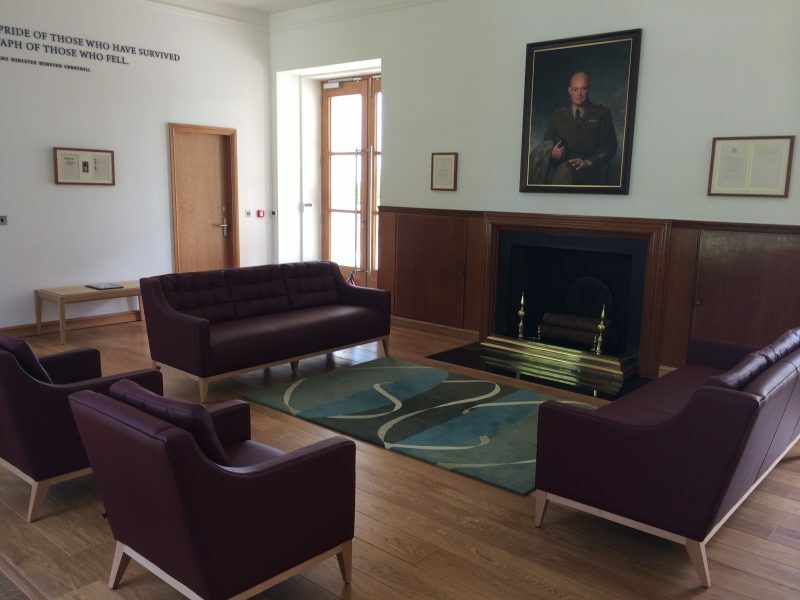 As part of a £4m refurbishment plan which has seen the construction of a new interactive visitors centre, Andrew was enlisted to design the interior of what was the visitor building but is now the cemetery’s reception area. With a 1950s aesthetic (the cemetery was founded in 1956) Andrew has turned what was a sombre and functional area into a bright, light contemporary space whilst maintaining a reverent atmosphere. 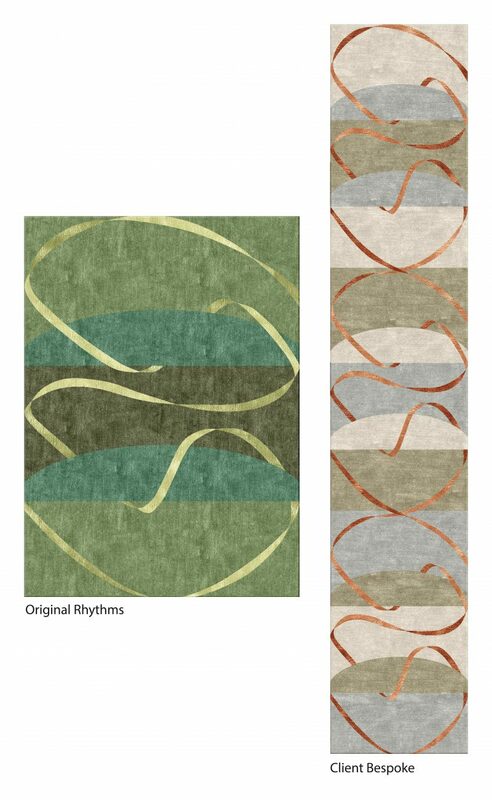 Cleverly Andrew’s choice of ‘Rhythms’ echoes the shades of green in the mosaic mural on the back wall of the cemetery Chapel which is housed in the Memorial Building.